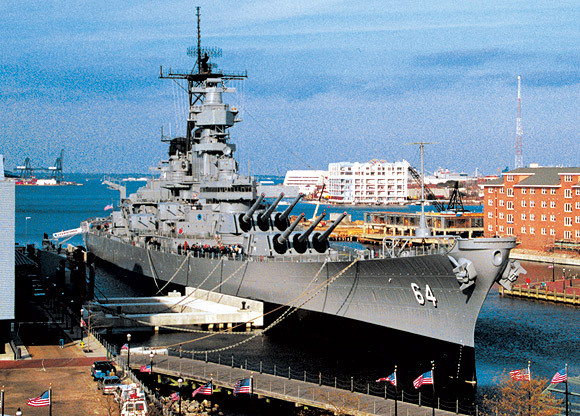 USS Wisconsin (BB-64), one of the four Iowa class battleships, began her career in the middle of World War II. Wisconsin reported for duty with the Pacific Fleet in October 1944. The powerful new warship joined Admiral William F. Halsey's 3rd Fleet when the liberation of the Philippines was underway. The battleship helped neutralize Japanese sea, air and ground forces occupying the islands. Wisconsin was reassigned to the 5th Fleet in February 1945 and supported the landings on Iwo Jima and Okinawa. The Wisconsin shelled a Japanese oil refinery, steel mill and other Japanese industry in June 1945. The battleship's brief but active World War II career concluded with the transport of war-weary GIs back to the U.S. during operation Magic Carpet. Wisconsin entered the Atlantic Reserve Fleet at Norfolk in 1948, only to be recommissioned in March 1951 for the Korean War. She steamed to the Pacific and assumed her station as flagship for Vice Admiral H. M. Martin, Commander, 7th Fleet. The battleship provided gunfire support for American, Korean and other United Nations troops on the Korean peninsula until relieved by her sister-ship Iowa in April 1952. Wisconsin embarked on a series of midshipman training missions in the ensuing years. In 1956 a collision with USS Eaton (DD-510) damaged the battleship's bow. In a novel repair technique, the bow of the uncompleted battleship Kentucky was grafted on the older battleship in only 16 days at Norfolk Naval Shipyard. Wisconsin once again entered the inactive fleet in 1958, where she remained until 1988, when she was reactivated. 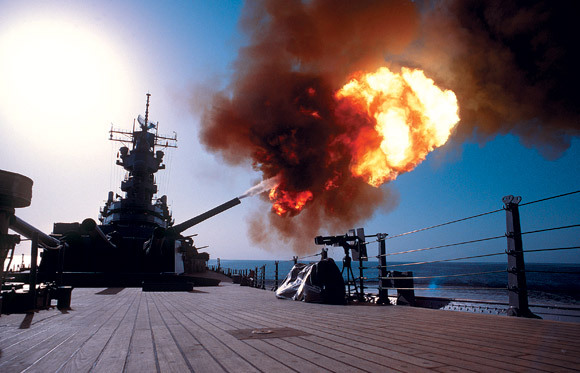 The ship carried new Tomahawk and Harpoon missiles in addition to her 16-inch guns when she steamed to the Persian Gulf in 1990 for Operation Desert Storm. After effective use of missiles and high explosives in the desert conflict, the battleship returned home to be decommissioned for the third time in September 1991. Wisconsin was moved to a berth at NAUTICUS in downtown Norfolk on December 7, 2000. Extensive exhibits interpreting "Wisky" are available for viewing in both NAUTICUS and the Hampton Roads Naval Museum. NAUTICUS is a maritime-themed science center featuring more than 55,000 square feet of hands-on exhibits, interactive theaters, aquaria, digital high-definition films, and an extensive variety of educational programs. A gift shop and restaurant complement the experience. The City of Norfolk oversees the Wisconsin project.